It's 12am in San Diego and you are awake and hungry, but you don't want Mexican or fast food. Where do you go? This is frequent conundrum takes place night in and night out in America's Finest City, so we decided to round up all the best late night dining options available. From diners, to steaks, to Asian eats and pizza, here is our list of more than 15 spots to satisfy those midnight cravings. The health gurus say that you should not eat after 8am, but we say "HOGWASH!" to that. When that craving hits, sometimes you need to satisfy it. Below we list off the top late night food options from all around San Diego. Buddy's Diner (Pacific Beach) - PB's newly opened 24 hour, 50's-era diner serves breakfast all day and night and has over 20 milkshake options to compliment a lengthy menu of traditional diner fare. The Asian Bistro (Hillcrest) - Previously Jimmy Wong's Golden Dragon Asian Bistro, Hillcrest's The Asian Bistro is open to 3am daily, offering an eclectic menu of Thai and Asian fusion dishes, as well as beer & wine. Studio Diner (Kearny Mesa) - Set on the former lot of a TV and movie studio, Studio Diner is a San Diego mainstay that has been featured on Food Network’s “Diners, Drive Ins and Dives” and numerous local television news shows. They serve classic diner fare from 5:30am til midnight Mondays, Tuesdays and Wednesday, and when stay open from 5:30am every Thursday until Sunday at midnight. Turf Supper Club (Golden Hill) - Dishing out cocktails and steaks since the 1950's, Turf Supper Club is San Diego's original grill-your-own-steak spot and one of the oldest cocktail lounges in town. The restaurant is open until 2am every night with food served until 1am. Du-Pars (Downtown) - This 24 hour diner recently moved from the Midway district to the heart of downtown San Diego and serves up from-scratch dishes, including burgers ground in house and a variety of baked goods. Operating since 1938, Du-Pars has numerous locations in the Los Angeles area, with one in Las Vegas. Hong Kong Restaurant (Hillcrest) - Serving up Mandarin and Szechuan cuisine nightly until 2am and 3am on Fridays & Saturday, Hong Kong Restaurant is available for no frills fast-casual service to satisfy cravings for dumplings, fried rice, orange chicken and more, as well as beer and wine offerings. Brian's 24 (Downtown) - This family run eatery has been serving up classic American comfort foods in downtown San Diego since 2008. If you're really hungry try to conquer the Pancake Monster Food Challenge - a heaping dish consisting of five buttermilk pancakes, four strips of bacon, two sausage patties, an eight-ounce ham steak, an eight-ounce country-fried steak and three eggs on a bed of home fries. If you can get it all down in under an hour, it's free! Isakaya Masa (Mission Hills) - This traditional Japanese isakaya serves up delicious dishes like sushi, ramen, and teriyaki until 1am every Tuesday-Sunday, as well as a multitude of beer, wine and sake. Be sure to try the incredible tuna carpaccio and call to make sure that they didn't lock their doors because they are too packed! Lestat's (Normal Heights, University Heights) - Both the original Lestat's Coffee House in Normal Heights and Lestat's on Park in University Heights are open 24 hours a day, serving a variety of French-inspired sandwiches, salads, quiche and coffee at all hours. Rose Donuts (Linda Vista) - This cash-only donut spot serves up those sweet o-rings 24 hours a day, in addition to ice cream, coffee, muffins, bagels, breakfast sandwiches and more. Get the croissant breakfast sandwich and an apple fritter and you'll fall right to sleep! Saigon On Fifth (Hillcrest) - Open until 2:30am during the week and 3am on Fridays & Saturdays, Saigon On Fifth has been dishing out a large menu of Vietnamese comfort foods since 2006. The menu at Saigon goes far beyond pho noodle soup, and the restaurant also has a full bar to help keep the party going into the wee hours. Basic Urban Kitchen (East Village) - This casual East Village hotspot serves gourmet thin-crust pies served alongside a variety of craft beers, open and serving food until 2am nightly. The mashed potato pie is legendary! Rudford’s Restaurant (North Park) - Established in 1949, this old-timey spot serves classic diner fare around the clock - 24 hours a day, 7 days a week. The retro diner also has beer and wine, as well as a private parking lot. Fat Sal's (Pacific Beach) - Open until 3am on Tuesday, Thursday, Friday & Saturday, Fat Sal's Deli has a menu filled with wild sandwich concoctions like the Fat Jerry - with cheesesteak, chicken fingers, mozzarella sticks, crisp bacon, fried egg, French fries, mayo, ketchup and salt & pepper on a hero roll. Night & Day Cafe (Coronado) - Head over the blue bridge and enjoy unpretentious American diner food and Mexican staples until 3am on Fridays & Saturdays, as well as late hours on other nights. Tajima (Kearny Mesa, Hillcrest, East Village) - This burgeoning ramen empire keeps popping up locations around San Diego. There are 2 locations in Kearny Mesa, one in Hillcrest, one in downtown San Diego, and new outposts planned for University Heights and even Tijuana. Most of the locations offer late night dining on the weekends, with the Hillcrest spot open latest - til 3am on Fridays & Saturdays. Peterson’s Donut Corner (Escondido) - Open 24/7, this North County donut hub offers so many sweet treats including donuts, puffs, crullers, twists, bars, pastries, cookies, brownies, cakes and muffins. Mexican Taco Shops Galore - Okay, I know you're not looking for Mexican food, per se, but late night taco shops are everywhere in San Diego and are sometimes just too convenient to pass up. 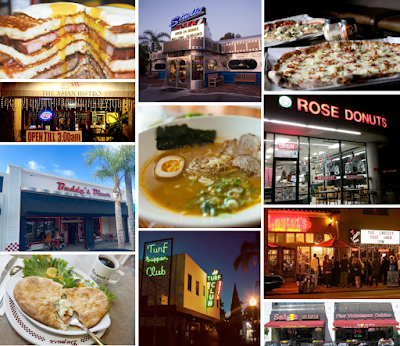 Here are some of our favorites - El Cotixan (Clairemont) Vallarta Express (Clairemont & Pacific Beach), Trujillo’s Taco Shop (College Area), Rigoberto’s Taco Shop (Miramar), Adalberto’s Mexican Food (Point Loma), and Humberto’s Taco Shop (Golden Hill).